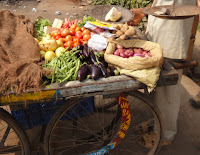 Food Security is probably the biggest challenge that India will face over the next few decades. It's closely tied to climate change because climate change is driving more extreme weather and a weakening in our monsoons over time--and these trends will make it increasingly difficult for farmers to grow enough food. But other factors, like fuel prices, will play a role here too because they affect the price of fertilizer, pesticides and transportation. Here you'll find some of our thinking on this complex set of issues. Back to the Future? This photo essay looks at animals in agriculture. Monsoons and Moonshots: A modest proposal for food security.